First a weather update: The last week has brought us two force ten gales lasting 48 hours each. According to meteorologists here as well as those from the neighbouring Russian station and Australian station (100km away), this is unusual for this time of year. The same is true for the particularly cold winter this (coastal) region has just experienced, with temperatures dropping to -42°C. Indeed, these two factors explain the very thick sea ice and snow layer the Xue Long is currently battling (snow makes ice-breaking even more difficult as it sticks like cement around the ship's hull). In comparison, in 2007 the Xue Long left Shanghai on 12th November and moored 20 kilometres from Zhongshan Station on 8th December. This year the icebreaker left Shanghai on the 20th October and on 7th December is was still only 28 kilometres from the station. Even if the initial plan to unload at Zhongshan from the 18th November was overly optimistic, this is by all accounts a very difficult year. The revised plan is now for the Dome A traverse team to leave Zhongshan by the 15th of December. Fortunately a significant portion of the traverse cargo and equipment for the traverse has now been unloaded by the helicopter, exploiting every available window of good weather. Aside from its future role as support platform for Kunlun Station at Dome A, Zhongshan has been, and will continue to be the logistical hub of Chinese scientific research activities in East Antarctica. 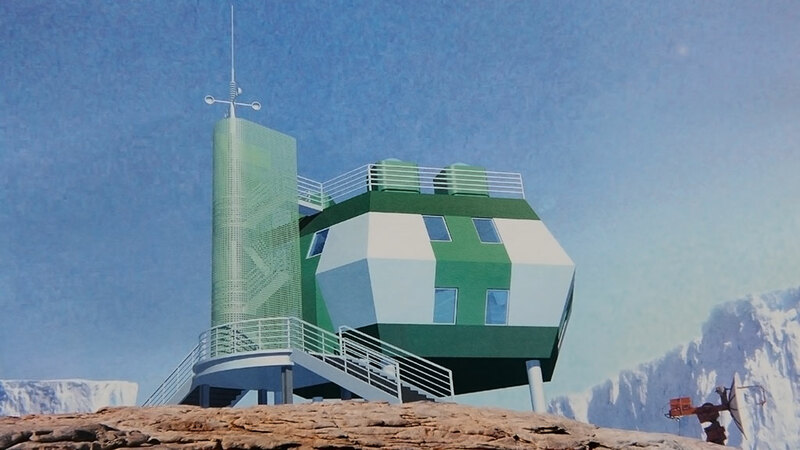 Located in a small ice-free coastal region squeezed inbetween the ice sheet and the ocean, Zhongshan supports scientists doing research both at the station itself and out in the field, whether it be on the ice sheet, the neighbouring Amery Ice Shelf, in the inland Groove Mountains, or in the Prydz Bay region. For the remainder of this article, I will highlight the key components of this research effort. One of the most difficult effects of climate change to predict is the extent of global sea level rise. Since records began, the largest contribution has come from thermal expansion of the oceans; however a growing factor in decades and centuries to come is predicted to be the melting and/or collapsing of ice sheets. In this context, Zhongshan is currently supporting PANDA, a multidisciplinary cluster of research projects focusing on the ice mass balance, ice dynamics, and ice-ocean interaction in East Antarctica. PANDA is China's leading research contribution to the International Polar Year (IPY) 2007-08 and will continue beyond this two-year effort. Focusing on a transect that extends from Dome A across the East Antarctic Ice Sheet, through the Lambert Glacier-Amery Ice Shelf-Prydz Bay Basin, and all the way into the Southern Indian Ocean, the PANDA research zone effectively dissects the largest ice sheet on Earth, as well as the third largest ice shelf in Antarctica. Ice sheets (thick accumulations of ice resting on bedrock) are features of the ice-age Antarctica is currently experiencing. With a surface area roughly the size of Australia, the East Antarctic Ice Sheet has an average thickness of 2.5 kilometres, and is more than 4.5 kilometres thick in places. Ten times more voluminous than either the West Antarctic Ice Sheet or the Greenland Ice sheet (the 2nd and 3rd largest ice sheets on Earth), the East Antarctic Ice Sheet contains some 70% of the worlds fresh water, and would raise sea levels by 60 metres if it were to melt completely. An ice-making system of truly gigantic proportions, it is fair to say that the East Antarctic Ice Sheet is one of the Earth's largest and most central geophysical features. As the East Antarctic Ice Sheet spreads via plastic flow outwards towards the sea (as a result of ice elasticity and the pressure of its own weight), it spills over the continental coastline through glaciers. In certain places it then extends further over the ocean, forming features known as ice shelves, which float whilst remaining attached to the coastline. Ice shelves usually vary between 100 and 400 metres in thickness. The largest Antarctic ice shelves are the Ross and the Filcher-Ronne Ice Shelves (circa 500,000 square kilometres), with the Amery Ice Shelf in third place, extending to some 60,000 square kilometres. Some smaller ice shelves on the more temperate Antarctic Peninsula have already collapsed as a result of warming oceanic and atmospheric temperatures. The PANDA research transect cuts through a 1.5 million square kilometre region of the East Antarctic Ice Sheet that drains through the Lambert Glacier, feeds into the Amery Ice shelf, and eventually calves into icebergs that float northward into the Southern Indian Ocean. By monitoring different variants of this dynamic ice flow system, PANDA hopes to be able to answer key questions about the increase or decrease in volume (ice mass balance) of the East Antarctic Ice Sheet and its effect on sea level. In part, this is done by retrieving shallow ice cores during traverses to measure the rate of snow accumulation on the ice sheet, and comparing this data with estimations as to the annual volume (or velocity) of ice that is flowing out through the Lambert Glacier and Amery Ice Shelf. Far from just impacting sea level rise, however, this dynamic system is also thought to affect oceanic circulation according to the varying quantities of melted ice (or fresh water) released and mixed into the different Indian Ocean water masses, (including surface water, intermediate water, and heavy bottom water). This aspect of the East Antarctic Ice Sheet system has in fact been continuously monitored by Chinese Antarctic expeditions for the past eighteen years, and will continue to be monitored within the wider context of PANDA. Unlike the Greenland and (to a lesser extent) the West Antarctic Ice Sheets, which are currently losing mass and increasingly feeding sea level rise, the ice mass balance of the East Antarctic Ice Sheet is generally considered to be stable (perhaps as a result of its sheer size and inertia), with some research suggesting that it may in fact be gaining mass as a result of increasing snow precipitation caused by rising humidity levels. Whatever the case may be, the volume and importance of the East Antarctic Ice Sheet means that it merits close monitoring and research as climate change unfolds - in essence, seeking a better comprehension of its fluctuations and responses to past climate variations in order to better predict its response to future climatic change. The second, equally important research domain being facilitated and researched at Zhongshan are the atmospheric sciences. These include lower and upper atmospheric physics, atmospheric chemistry, and a host of other atmospheric related research topics ranging from meteorology and katabatic winds, to radio wave propagation and geomagnetic observations. magnetosphere: A region of space around the Earth and over the ionosphere, whose fluctuating shape is determined by the Earth's interior magnetic field. The magnetosphere is responsible for such phenomena as magnetic storms and the auroras observable in the both Polar Regions. Uniquely, Zhongshan Station is located on almost the same magnetic field line as the Chinese Yellow River Station in Svalbard, in the Arctic, where China has established a similar observation platform for the upper atmosphere. This very rare alignment makes Zhongshan an ideal location for scientists to study conjugate auroral prectipication, or auroras with the same source taking place in synchrony in both the Arctic and the Antarctic. What's more, Chinese work on the magnetosphere is conducted in close collaboration with Japan's National Institute of Polar Research and its Antarctic station, Syowa, also located in a very favourable position for this work, some 1,000 kilometres from Zhongshan station on the coast of East Antarctica. Thanks to this ongoing collaboration and to Zhongshan's alignment with Yellow River Station in Svalbard, it is fair to say that Chinese atmospheric scientists benefit from one of the best observational networks on Earth for studying the ionosphere and auroras. In the separate field of atmospheric chemistry, research is being carried out on climate change and anthropogenic-related questions touching on ozone, carbon dioxide and methane, as well as trace gases found in the troposphere and stratosphere, adding valuable data to that generated by other monitoring stations scattered around Antarctica. On the topic of katabatic winds (the Earth's most powerful winds, originating in the central ice sheet region, with speeds in excess of 200 kilometres per hour), researchers are monitoring velocity, temperature and humidity in order to detect any changes in patterns, perhaps in response to climate change. Finally, Zhongshan Station has been and continues to be a privileged logistical platform from which one can organise geological meteorite-finding expeditions to the Groves Mountains some 300 kilometres inland. A series of peaks and nunataks that rise through the East Antarctic Ice Sheet, the Groves Mountains contain fields of very old blue or bare ice where the lack of snow accumulation makes it possible to find meteorites still lying on the surface. Indeed, the topography of the Groves Mountains has already lead to some stunning discoveries, both in terms of meteorite size and composition. Part of the 2% of Antarctica not covered by ice, the Groves Mountains are also an ideal place for geologists to investigate the geological and tectonic evolution of Antarctica and the Prydz Bay region going back to when East Antarctica was still attached to the African continent as part of the Gondwana super-continent. This work should eventually connect to the larger tectonic history of East Antarctica and of the sub-glacial Gamburtsev Mountain Range that lies under the ice sheet beneath the Dome A region. Zhongshan has been and will continue to be the logistical hub of Chinese scientific research activities in East Antarctica.